In The Flash Episode 5.13, things are not going well for Team Flash. Once again, their plans have gone awry despite purposely putting themselves in harm’s way in order to catch the season’s Big Bad, Cicada (Chris Klein). 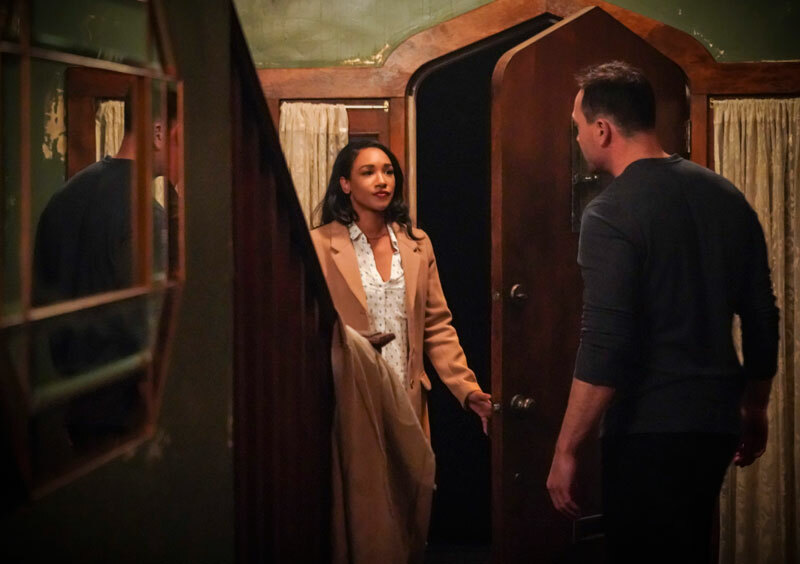 This week, it was not only Barry (Grant Gustin) and Ralph (Hartley Sawyer) with the bad plan, but also Iris (Candice Patton) who, in order to spice up the stories in her fledgling newspaper, The Central City Citizen, decides to seek out Cicada on her own. At the end of it all, the team is not much closer to catching Cicada then they were at the beginning of the episode. I am left waiting for Team Flash to catch a break in the pursuit of this meta-killer. Caitlin delivers the ‘good news, but…’ information at the beginning of the episode: Cisco has nearly completed the meta cure, but… in order for it to work on Cicada, he must be immobile for a minute. Luckily, she knows of a device that will immobilize him but… the tech has been stolen and no one knows how to get it. It’s Ralph to the rescue, who knows a guy thanks to his previous work as a PI. Ralph’s informant tells Barry and Ralph that the tech is in the hands of a criminal named Goldface, a known black market arms dealer. It’s time for our guys to suit up and go undercover as criminals looking to purchase some contraband weapons. Our two heroes arrive at the designated spot to meet up with the arms dealers, but it looks deserted. Ralph speaks the code phrase and they are suddenly transported to an undisclosed underground location, with power dampening cuffs strapped on their wrists – a precaution against metas they are told. Barry and Ralph are then escorted to a huge hall that looks like a trade show, complete with weapons dealers hawking their wares. Ralph goes in search of the tech they are there for, while he instructs Barry to try to fit in and not blow their cover. Unfortunately for Barry, I wasn’t feeling the whole dress all in black to look like a criminal vibe. I didn’t buy it. And neither did the weapons dealers, especially after Barry tries to buy an entire lot of guns that were designed to shoot through police armor. The dealer who was trying to sell the weapons was on to Barry, and pressed an alarm button, alerting Goldface’s henchmen. Goldface can sense that Ralph has that certain air of the criminal about him — Goldface called it scum — but doesn’t sense it in Barry. 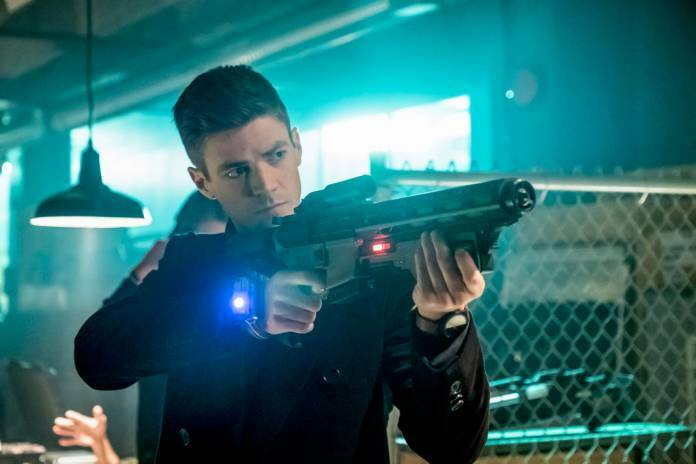 With a gun pointed at his head, Barry covers nicely; he claims that he is nobody – a criminal without a record or any convictions who can leave no trace of his existence at a crime scene. He claims he is the Chemist. Goldface buys the con and agrees to let Ralph and Barry take the neurostasis field generator, but only after they help complete a job for him. The job he has in mind is stealing a 3-D printer that can make body organs. They are stealing it from a lab before it can get to a hospital and save lives. Barry agrees to do it, telling Ralph that the ends justify the means, but Ralph won’t let Barry cross that line. When they get to the lab, Ralph locks Barry in the truck after the other criminals go on ahead. Ralph finds the printer, but when he reads the list of people scheduled to get organs, he cannot go through with the heist either and instead punches one of the henchmen and fights his way out of the building. By this time, Barry has broken out of the truck and he and Ralph go back in the building. Armed with guns set on stun, they take out the team of henchmen. It was a change to see the two of them fighting side by side without using their meta powers. Just as they are thinking they were getting away, their power dampening cuffs begin to glow; Goldface has arrived and is threatening to blow their hands off. The two of them shoot Goldface but he rises again. It turns out that Goldface is a meta. Beneath his skin is a layer of protective gold that that makes him impervious to just about everything. Goldface starts putting a hurting on Ralph and Barry, and can also use his gold chain like a lasso. He is choking Ralph but gets distracted by Barry. Goldface hurls his chain at Barry but Barry moves away just in time so that the chain strikes a power box that Barry was standing in front of. Goldface is badly electrocuted and his face melts, with gold pouring out of his eye sockets. It was a unique special effect to watch and probably one of the more memorable of the season, second only to the episode with Rag Doll. On the Iris side of the episode, Iris interviews one of Orlin’s coworkers to get news about Cicada for her newspaper. She learns his home address and comes up with a bad plan of her own. She goes there alone and breaks into his house. Why she would do that without telling anyone or getting backup just seems reckless and foolish to me. It does, however, illustrate how far she will go to get a story. While Iris is there snooping around, Orlin comes home. He appears to be in some pain, but senses Iris’s presence. He grabs one of his Cicada daggers and looks behind the couch where Iris had been hiding, but she wasn’t there. Iris tries to sneak out the front door, but the door squeak alerts Cicada to her presence. Thinking quickly, Iris pretends that she just walked in because she is interviewing families in the neighborhood about lead in their drinking water. Orlin goes along with her, until she grabs her purse to leave. He remembers that she did not come in with a purse. He grabs a Cicada dagger again, but feisty Iris fights back, grabbing something off the kitchen counter and stabbing Cicada in his glowing open shoulder wound that is claiming his life. Iris is able to get away but by the time she calls Barry, Cicada is gone. It is frustrating to see that once again the team comes up empty-handed. Barry did not get the tech to immobilize Cicada, but Iris has a plan about how to administer Cisco’s meta cure to him, holding up the bloody pencil (or was it a pen?) that she stabbed Cicada with. He is vulnerable. Things have to turn their way soon; this Cicada storyline is starting to feel old and dragged out, with little progress. 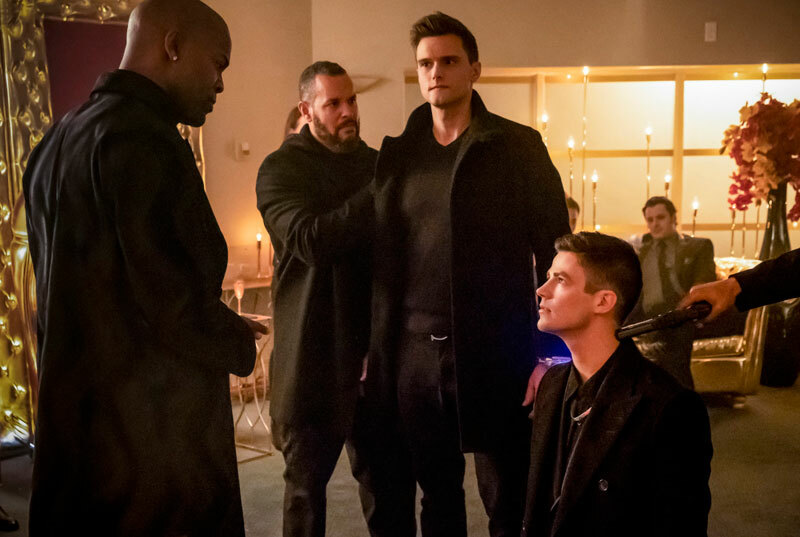 I don’t think I’ve fully enjoyed any of the episodes since the Elseworlds crossover. 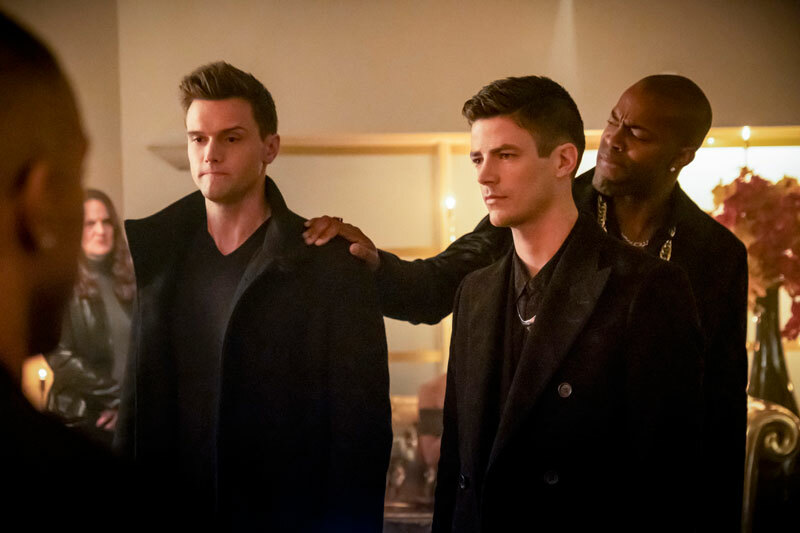 I’m consoled by the fact that The Flash has already been renewed for next season, but I am concerned that for me, the excitement factor for the show is waning. Elsewhere in the episode, there was a very nice swoon-worthy surprise for fans of actor Tom Cavanagh. Not only do we get to see him as Sherloque and the Reverse Flash, there is a nod to his pursuits outside of the Arrowverse. Nora knows that Sherloque is investigating her and reports her fears to Eobard Thawne. But of course, Eobard has a plan. He instructs Nora to distract the sleuth with his weakness: love. Sherloque has been married seven times after all. 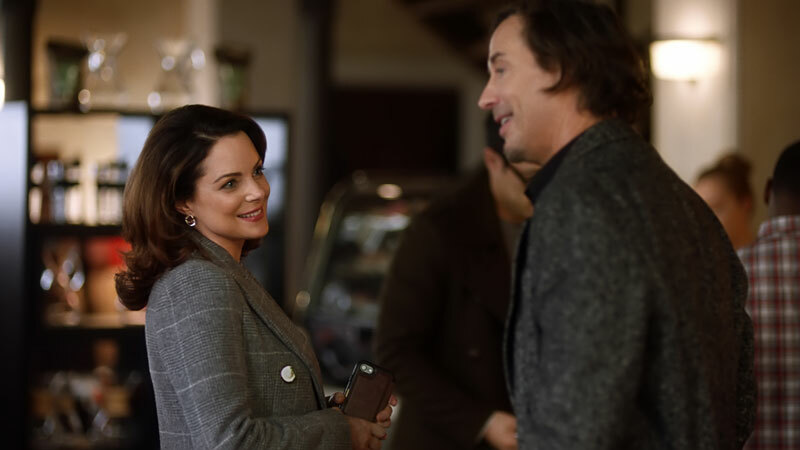 Nora invites Sherloque to Jitters and arranges a ‘chance’ encounter with a woman named Renee Adler (a tribute to the Sherlock Holmes character and romantic interest Irene Adler), who is played by Kimberly Williams-Paisley. She has acted opposite Tom Cavanagh before – she played his wife in the 2006 movie How to Eat Fried Worms and he also appears as her love interest in the Hallmark Movies & Mysteries Darrow & Darrow series. Sherloque is instantly attracted to Renee but he scares her away by using his great mind to deduce too many facts about her. She thinks he’s a stalker. Dejected, Sherloque feels he is destined to be alone. 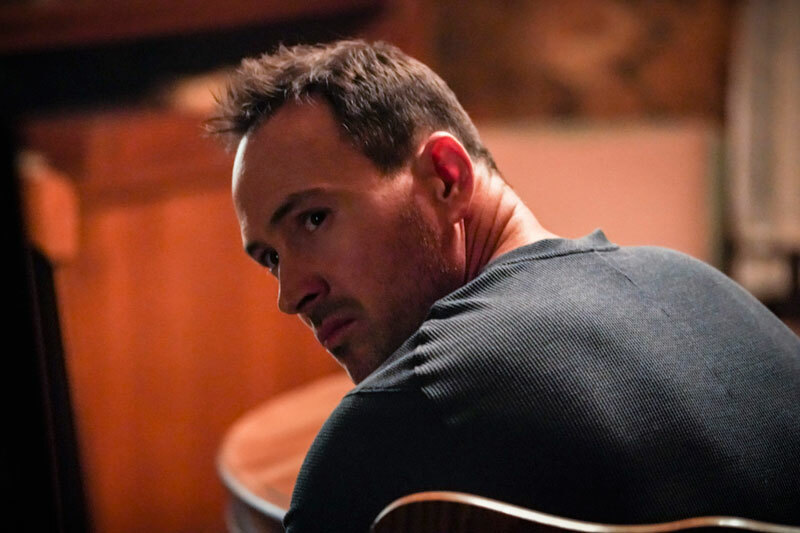 Trying to help him, Nora succumbs to the bad plan syndrome of the entire episode and rounds up Sherloque’s ex-wives to talk about why they fell in love with him. Surprise: all of the ex-wives are played by different versions of Kimberly Williams-Paisley! 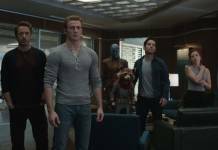 Unfortunately, Sherloque owes all of them alimony, so instead of helping him, they make threats and vow to pursue him now that they know where he is. In the end, Sherloque goes back to Jitters to try again with Renee. She finally agrees to meet him for tea another time and as she leaves, the door opens seemingly on its own. Sherloque deduces that Renee is a meta and when he goes back to S.T.A.R. Labs, he closes his Nora investigation and goes back to investigating Cicada because he does not want Cicada to kill Renee. Nora is pleased. But is anyone else worried that the only person who comes up with successful plans on this show seems to be Reverse Flash? Next week’s preview (watch below) teases a time travel episode with Nora repeatedly trying to stop Cicada from killing Iris. “The timeline is malleable” is the mantra that Nora seems to live by but will it be malleable enough for her to save her parents? We will have to wait until next week to find out!